Addiction treatment is a time that marks personal growth. You have to be courageous and strong to enter recovery from drugs and alcohol. An addiction is easy to get, but hard to overcome. 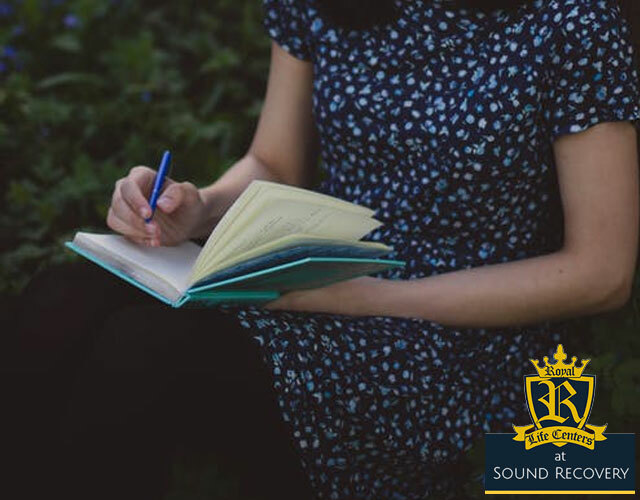 Many enter the treatment process broken down in the mind, body and spirit, which is why at Royal Life Centers at Sound Recovery, we build you back up for a holistic recovery. Our goal is to teach you all the skill and tools you will need to rebuild a healthy, happy, and meaningful life in sobriety. 1. What did I do to strengthen my recovery today? For this question, you could write about a 12-step meeting you went to, or the new friend you made for your sober support network, how you shared openly and honestly in therapy, etc. Anything you did that strengthened your recovery should be documented, because even the little things you do to put your sobriety first is an accomplishment. 2. What problem behaviors did I exhibit today? This is the area where you list any problem behaviors that persisted through out the day. Whether you were closed off, engaged in negative self-talk, glorified drugs or alcohol, avoided talking about a problem, or broke a rule, any negative behavior that hurts you or your recovery belongs in this category. 3. What could I improve from today? Basically, if you engaged in a problem behavior or experienced yourself as less motivated, anything that you could improve on should be written down. If you write down things you could improve on, it gives you a great guide to a starting point. 4. What did I learn about myself today? This area is reserved for any insight you gained about yourself during the day. If you have more than one thing you learned about yourself, go ahead and list all of the things you learned. It’s especially cool to look back and see all of the insight you’ve gained during addiction treatment, and it can become a great reminder for the future. 5. Did I set or accomplish any goals today? If not, what did I do today that brings me closer to my goal(s)? Goal-setting is a critical part of addiction treatment. You should set a variety of goals, small and big. Goals help you by guiding you, giving you something to work towards. If you didn’t complete a goal for the day, did you behave in a way that’s aligned with your goal or goals? Have you set any goals today? 6. What is one problem I had today? How did I solve it? Stating one problem and how you solved it that day is a great exercise to better understand your thoughts, feelings, and reactions in stressful situations. We will learn in addiction treatment how to problem-solve in the most effective way. You’ll love to see the changes you make in your own problem-solving skills once you revisit this section. 7. What is one coping skill that I learned today? Through out addiction treatment, you will learn various coping skills and tools to help you get through anything that life throws at you. This is a great section, because it will remind you about all of the tools you have to overcome different challenges you face. 8. What’s one problem behavior that I challenged today, and how did I challenge it? This section is all about bettering yourself. It’s one thing to gain insight, and another thing to use it. In this section, you will see personal growth very clearly in the way that you challenge yourself in treatment. The way you challenge your problem behaviors will make for a life-changing experience in addiction treatment. 9. Did I learn about any new triggers for me today? What were they? It’s so important to identify your triggers, or the people, places, and things that trigger a craving for substances. By identifying your triggers, you can then learn how to safely navigate the cravings they cause if these triggers are unavoidable. Learning about your triggers will help you prepare a relapse prevention plan. 10. What am I grateful for today? Gratitude is one thing that should never stop being practiced. We often focus negatives in addiction treatment, like all we have missed out on or lost, but we need to shift our thinking patterns and learn to be grateful for what we have and the opportunity to be changing our lives. Practicing gratitude will also put you in a positive mindset, which greatly benefits the recovery process. You can also ask yourself any questions that you see fit, and record your answers for further reflection. The exciting thing about writing down your answers, is seeing how they change— and how you change! Your growth will show as you get further into the recovery process, and more confident in yourself and your recovery. It’s a beautiful thing to see all the insight you have gained over time, but even more beautiful to make positive changes from that insight. These ten questions above are a great starting point for reflection and mental check-ins. Part of recovery is putting what you learn to good use, and constantly looking to better yourself. If you or someone you know is struggling with an addiction, please reach out to our addiction specialists for guidance and support, at (877)-RECOVERY or (877)-732-6837. Our team is available 24 hours a day, 7 days a week. Because We Care.